Every so often I have featured one of my Studebakers as "Stude of the Month." I purchased this 1949 Champion Starlight Coupe in June of 2004. Other than being equipped with an overdrive transmission, this car came from the factory with no options to speak of. It does not have a radio or turn signals, but I may add both as time goes on. A Ford underdash heater and defroster unit was installed at some point. The car was originally black, but a former owner had it repainted in a what appears to be Maui Blue, a color that was not available in 1949. I like this color, so I will stick with it even though it is not correct. After a few outings last fall, the car is being worked on this winter to bring it up to standard. As can be seen in the pictures, it does not have rear fender gravel shields, so I am looking for a pair of the stainless steel type to spruce it up. It has been a long time since I had a car with a 6 volt electrical system and vacuum windshield wipers, but I am old enough to remember both. Plans are to have the little Champ back on the road by spring. These pictures were taken by Bill Junge at the November 2004 Goodguys Rod and Custom Association Southwest Nationals in Scottsdale, Arizona. I don't know who owns this outstanding Stude wagon, but it is a really nice ride. Bill Junge has his own web site called Bullet Nose Paradise which is dedicated to 1950 and 1951 Bullet nose Studebakers. Thanks again to Bill for helping to keep this page in new material. This cool 1941 Studebaker President Street Rod belongs to Benton Gill of Goodman, Misouri. After purchasing the car for $200, it took four days with two friends and a backhoe to remove the car from its resting place. Benton totally rebuilt the car over a ten year period. Power comes from a Chevy small block 305 that was completely rebuilt. The front frame, rear end, and running gear are from a 1970 Camaro. The wheels are 80 spoke wires from Victoria Wheel. It has a Chevy tilt steering wheel and column and power brakes with discs in front. The dash gauges were all missing or broken so a digital dash was installed. The seats are from a 1989 Chrysler and have been rebuilt and recovered in a soft two-tone gray. Except for the seat covers and the engine rebuild, all work was done by Benton and his spouse. The President has been driven on vacation from Missouri to Las Vegas, Nevada. This fine car has won over 35 trophy's at various car shows. These pictures were taken by Preston Young at the 2004 Studebaker Drivers Club International Meet in Charlotte, North Carolina. Preston owns a 1965 Studebaker Cruiser and is a member of the Central Virginia Chapter of SDC. Thanks to Preston for making these available. Joe Robertson sent in this picture of a drug seizure 1958 Studebaker Silver Hawk. This car was scheduled to be auctioned by sealed bid by the North Carolina State Surplus Property Agency in December 2004. Does anyone know what became of it? This 1957 Studebaker Transtar flatbed has a rebuilt flat 6 engine, a working dooley hoist, and a new paint job. The truck is for sale. If you are interested, you can contact Mike here. 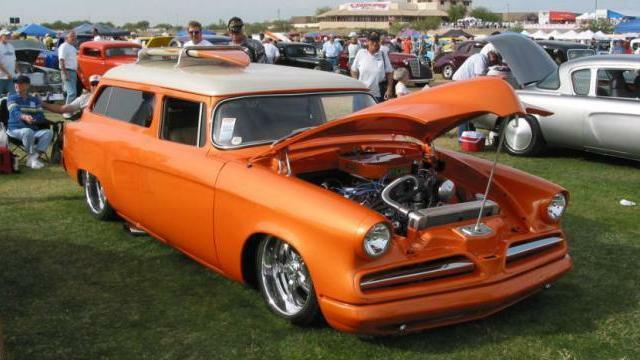 Greg Satterlee of Moore Oklahoma sent in several pictures of a Studebaker four-door sedan that he purchased as a street rod project. The previous owner removed the VIN number and there is no title. Greg's best guess is that it is a 1935 model. Can anyone shed further light on this? If so, Greg can be contacted here. The feature toy this month is a rare Solido of France 1951 Studebaker Starlight Coupe. The hole in the side is for the key to the wind-up motor. Solido is still in business and is perhaps best known for its high quality military models. This example was recently listed on eBay. More toy Studes can be found in the Stude Stuff area of this page and on my Studebaker Toys Home Page.